Last week, a listener wrote in, asking me about the graft bill — er, tax bill — and I replied that there would surely be astrologers watching the CNN live feed, as the Donald signed it into law, to record the moment of its “birth.” Little did I know, I would be one of those astrologers, but there I was on a sunny, Florida morning, watching CNN, and listening to the cameras in the Oval Office, clicking and whirling. He began talking at 11:05 AM, but did not put his “Donald J. Trump” on the bill till 11:24 AM Eastern US time. (Scroll down for an image of the chart.) He then held it up like a proud schoolboy showing off his homework. The signing chart speaks to the bill’s potential, its fate, and its future — all of which are rather juicy, if I do say so myself! 45 does not appear to have an astrologer on staff. Or at least, not a very good one! It’s an inauspicious chart. He decided to do it on the precise day of Mercury’s station, at a moment when the Lord of Communications and Numbers was stopped dead in the sky, still facing backwards. Mercury is high in the Ninth House of the Washington, DC chart, ruling both the Seventh House of the public and the Fourth House of national security. The Pisces Ascendant is on the Arabic Part of Fatality, suggesting that the bill could kill things. Watch for major shifts in power next year, that can be traced to the events of this week. Being in Sagittarius, Mercury answers to Jupiter in Scorpio (the sign of taxes) in the Eighth House (the house of taxes); Jupiter here is feeling more than usually spiky, because he senses Mars in Scorpio, sneaking up behind him. Mercury also receives an incoming square from Neptune in Pisces, who is placed in the Twelfth House of undoing, or unforeseen consequences. In about two weeks, as Mars gets to Jupiter and Vesta, and sets off the Nodes of Fate in a T-square, we the people will learn more about how badly we have been manhandled — notably with regard to property taxes or other housing-related issues. Watch for the typical Trumpian backpedaling, once folks start jumping and yelling. That jumping and yelling will be spearheaded by women, especially librarians, medical professionals, lawyers, and teachers (all Sagittarius professions). Venus is at the last degree of Sadge, also answering to Jupiter, and she is the highest (most powerful!) planet in the chart. She is out of bounds — a wild and free party gal, sowing her oats — and she’s on the potent Galactic Center (discussed in my New Moon column last week). She is also tightly trine to Uranus, and two other out-of-bounds Goddesses — Eris and Pallas Athena — all in warrior-princess Aries. 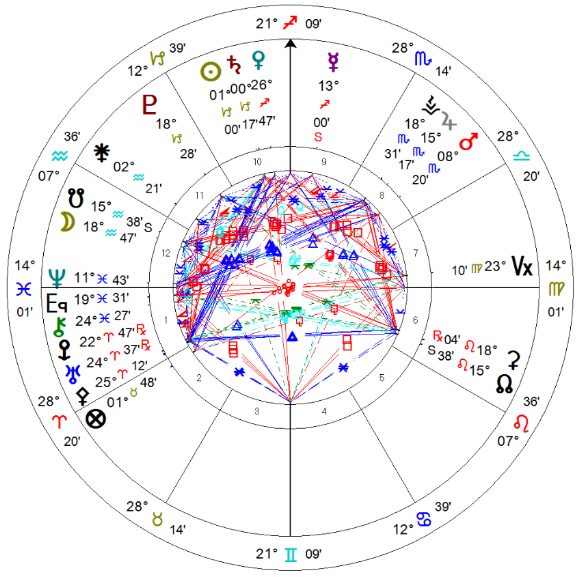 And (with a slightly wider orb) out-of-bounds Ceres and the North Node in Leo join the fun, for a passionate Grand Trine in Fire that emphasizes women, mothers, children, and our destiny. You may have thought the Women’s March last year was fierce, but you haven’t seen anything yet. As we’ve seen ever since Jupiter entered Scorpio, the righteously-angry feminine is speaking out and BEING HEARD in a whole new way. The manipulative masculine, not so much. The GOP clan (mostly older, male, white) all gathered for a celebratory party at the White House on Wednesday — yet the Donald did not sign the bill when they were there, and it wasn’t because the pens were late! But since Trump’s impulse control is next to none — he ignored McConnell, Ryan, et al., and signed the #GOPTaxScam into law on Thursday. Now, the hideously unpopular bill will go into effect in January 2018, which gives the voting public plenty of time to reckon with its effects (and discuss it all with their accountants this April) before going to the polls on November 6th, 2018. Next Election Day, we will find the Sun at 14 degrees Scorpio, conjunct the tax bill’s Jupiter at 15 degrees Scorpio. Furthermore, Saturn recently entered Capricorn, the sign of reality, leaving Sagittarius, the sign of exaggeration. Reality rules for the next three years. Attention, and a price, will be paid. Talk about the Christmas spirit!